My friend lived in Jammu for many years and then moved to Himachal. Now we were his guests at his Jammu house. It took us roundabout 2 hours to reach Patnitop by road from Jammu. We were not in a hurry, but also the pace was not very slow. He handled his small well travelled car with great ease like a seasoned driver on mountain roads. Here the roads in the Himalayas are not easy to negotiate without lots of courage and experience. He had both. We had a taste when returning from Khajjiar through Jyot. Some of that route I will remember for a long time for the sheer beauty of the twisting and turning high altitude Himalayan road. The distance of Patnitop from Jammu by road is about 110 kms. Being the national highway NH-1A from Jammu to Srinagar, Kashmir, the road condition was very good. From Jammu the first major wayside point we passed through was Udhampur which has also the major railway station carrying the same name. At least nine trains from Jammu either pass through or terminate at Udhampur. This is the nearest railway station from Patnitop, the nearest airport being at Jammu. The distance to Udhampur by road is about 65 kms and the area is mostly flat. My friend could maintain a good speed along this stretch. The next major wayside point was Kud and distance by road from Udhampur about 35 kms. Ghat road or hilly road had already started shortly after Udhampur as Kud altitude is about 6000 feet just short of Patnitop by a mere 500 feet. The distance from Kud to Patnitop is also a short one—about 10 kms. Effectively half the distance to Patnitop is flat and half hilly. But the ghat road here does not have much steep rise or sharp twists and turns. The surrounding hills have gentle curves as also the road hugging the side of the hills. From Kud to Patnitop is a very short distance as also the rise in altitude. I gathered that the name 'Patnitop' is derived from the original name of the place, ‘Patan Da Talab’ or ‘Pond of the Princess’. Perhaps a princess used to bathe in a lake in the meadows in forgotten times. Indeed we saw a small stretch of water downhill at a place. Patnitop falls in the district of Udhampur which is a major one in the state of Jammu and Kashmir. Patnitop altitude is about 6500 feet. Near Kud—Patnitop flows the Chenab river and the nearby town is Batote. The hill is relatively flat at Patnitop allowing the beautiful hill station to be built. We stayed at the Patnitop Guest house which is beautiful and was under expansion. The compound was old with a wide grass lawn in front. Being on a flat top, it commands a far view also. Varieties of trees, specially at the back of the compound make the place more attractive. This giant of a tree impressed us greatly. We have never seen such a tree. Perhaps it is a baobab. On one side of the compound, chaotic multi-colored flower bed looked perfectly natural in its beauty. Tukai looked from the top and the flowers seemed to have been sprinkled all over the bed, unorganized. To me natural beauty is order in disorder. Lots of old and young high altitude trees around the compound provide the green background. Sometimes I like only the tree trunks knowing that the trunks still have a living body. Four young vied with the old to reach the sky. Apart from this beautiful Patnitop Guest House, there are about a dozen good hotels spread around the area—they are not clustered. Each chose a suitable open place. To us Patnitop seemed to be unoccupied, but it actually is a town but a spread out town merging with the nature around. Patnitop is surrounded by softly curved meadows and valleys much of which has been denuded of its rich variety of trees. But wherever the hill rose straight up, it still could retain thick green cover at some places. Human hand didn’t erase the soothing green to drab grey of bare hillside. Humans in every region of the world have played their part in different times of history to cut away the trees mercilessly, embellishing the civilized world with artefacts. A partly natural artefact caught my eye because of its human like form. As far as I could gather there was no mechanized industry in this area because of the hilly terrain and remoteness. The villages spread along the hillsides are mainly sustained by terrace farming and tending herds of goats and sheep. Seasonal crops are mainly tomato, garlic and maize. The ground here is practically devoid of undergrowth and the open hillsides are undulating grasslands for grazing the sheep and goat. I laughed aloud when my friend told me the local name of the turns of the hilly road. Some of the larger turns with a good space are called टमाटर मोड़ (or tomator more in Hindi) where locals sit with baskets of fresh tomatoes to sell to the passengers in the passing cars. Being on the national highway from Jammu to Srinagar they should be doing good business by their standards. A local specialty of Kud is the mithai (sweets) Patissa made of बेसन (beson: gram-flour) and ghee. The other one is Kaladi which can be described as a kind of paneer ki roti —a dairy based product. My friend mentioned three places around as a must see for a tourist. We were not usual tourists and had no pressure to visit the tourist spots. The first is the Shudh Mahadeo Temple, a temple of Mahadeo Shiv 18 kms from Kud. The second is the Sanasar Lake about 20 kms from Patnitop. A lake amongst the green meadows must be very beautiful. And the third is the Natha Top maybe about 15 kms from Patnitop. We will talk about Natha Top when we take up our snow point again. The area having good tree covers away from the villages and habitations, a number of good trekking options are available from Patnitop along with trekking equipment arrangements. 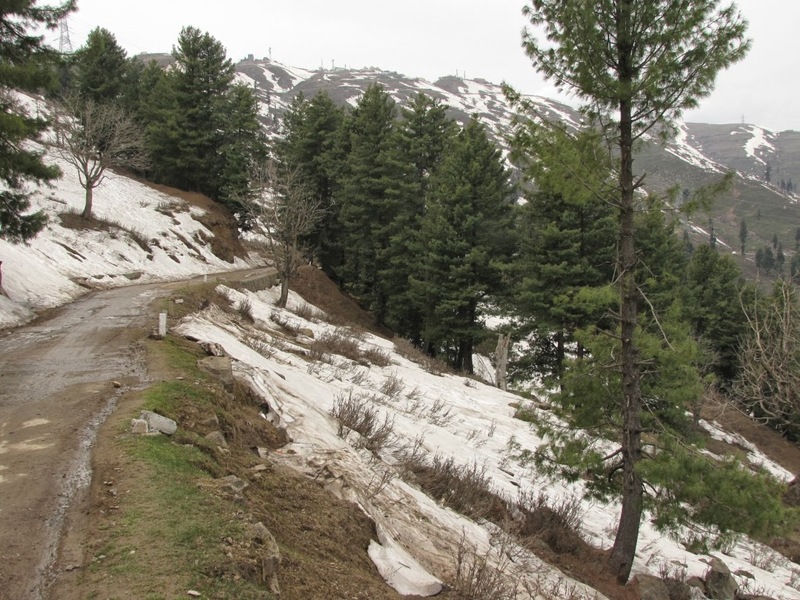 All trekking routes are open during the summer season, but some of the routes are open in winter also. On the routes of trekking good camping sites also seem to be available. When heavy snow accumulates on the slopes Skiing courses are conducted at Patnitop in the months of January and Feburary. Lastly aerosports such as Paragliding can be done at Sanasar Lake and from Nathatop I was told. Instead of visiting the usual tourist points we made merry at snow point where we could still get some snow cover in April. It was fast disappearing but was still there for us. That was our main attraction. I came to know later that the snow point was located on the road to Nathatop only. The locals told us that this was the only place where some snow cover was still left. The condition of the road was not very good specially because of the snow. Along this stretch embankments have been used to arrest landslides but the snow still had taken its toll. The villagers mainly commute on foot along this road and then take the trail uphill or downhill where their village lay. This road is their lifeline. The hilltops all around are totally denuded of tree cover, possibly because every winter they are covered with thick snow. Downhill the meadows retains still a few clumps of trees but it is only a matter of time for them also to disappear I felt. We had seen snow peaks from our Patnitop guest house but not from any other place on the way. I heard later that Nathatop offers a clear view of a range of Himalayan snow peaks. Well, we came to Patnitop just like that. What we had was enough for us. I have been to many hill stations in this country—mostly the renowned ones. That’s what we do. I feel that the modest, left alone and relatively unknown Patnitop gave me deep pleasures that lasted. Perhaps the reason was its apparently unspoilt natural views with few visible localities and soft gentle curves all around. The seclusion and softness might be a good attraction for couples and for honeymooners, I felt. To me Patnitop will remain to be a special little gem. Perhaps that was the reason why I chose first Patnitop leaving aside such stars as Khajjiar, Dalhousie and Dharamsala when I had started to tell you this story. (C) Atanu - www.travelnatureus.com - all rights reserved.